The authors examined the types of clinical services that are promoted by commercial advertising. They reviewed advertisements that appeared in the top media markets during the year 2012, including both television and magazine ads. They excluded duplicates, public service announcements, fund raising and research subject recruitment. Of 1,427 total advertisements, 409 were considered to be unique ads that promoted clinical programs at 102 different cancer centers. To analyze the content, the investigators developed a “code book” that included four domains; the types of clinical services, information provided, the use of emotional advertising appeals and the use of patient testimonials. Among the centers analyzed, 59% were for profit and the same percent were accredited by the Commission on Cancer. Sixteen percent were NCI designated centers. Advertising was also characterized by region of the United States. The results are interesting and instructive. Of the 409 unique clinical advertisements, 88% promoted treatment. This was demonstrably higher than the percentage promoting cancer screening at 18% or supportive services at only 13%. While the benefits of therapies were described in 27% of the ads, the risks were only mentioned in 2%. Emotional appeals were frequent with 85% of the ads evoking hope for survival. Cancer was often described as a fight or battle, and the use of fear (of death, etc.) was found in fully 30% of the advertisements. In their discussion, the authors pointed out several interesting findings. Among them, the “frequent use of emotional appeals and scarce mention of risk of services or quantification of benefit.” They also found “that NCI designated centers more frequently used emotional appeals related to survival or potential for cure.” These same centers “omitted information about risks, benefits and alternatives with similar frequency as non-NCI designated centers.” They concluded that “emotional appeals coupled with incomplete information are being widely used to promote services even among the nation’s most prestigious cancer centers.” Interestingly while only 5% of cancer centers in the United States are NCI designated, fully 16% of the clinical cancer advertising in 2012 was conducted by NCI-designated centers, a three-fold higher use. 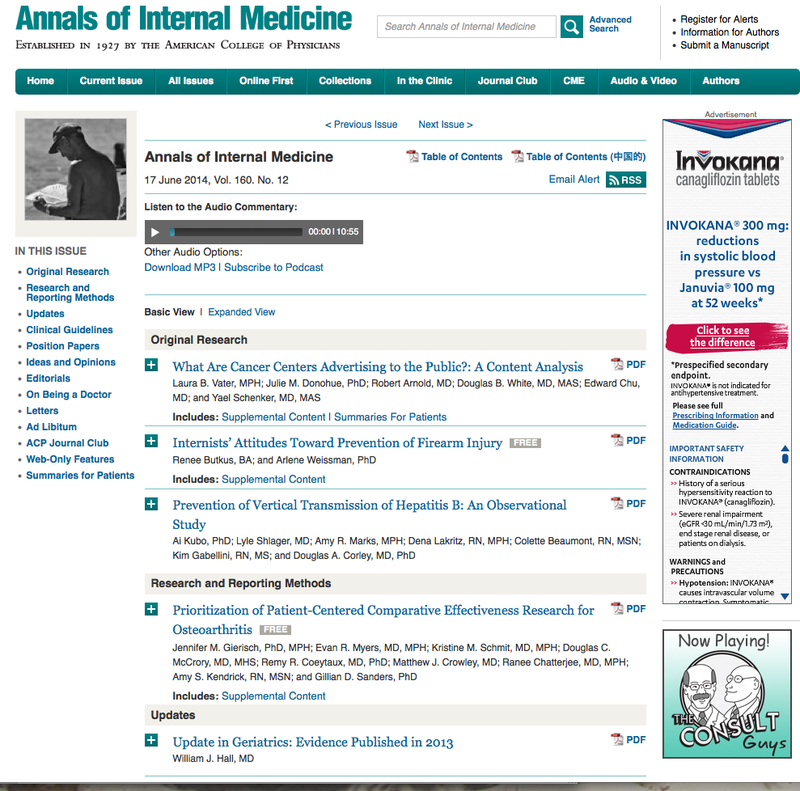 We applaud the authors of this Annals of Internal Medicine article for their unbiased and informative analysis. 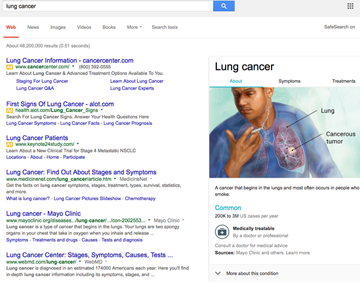 We must all strive to provide patients practical and actionable information about cancer and its treatment. It appears from this study that the practice of self-promotion crosses all lines of cancer care delivery from the most august academic institutions to the for-profit cancer centers. As with all activities in life, cancer patients are to be reminded of the ancient Roman admonition “Caveat Emptor” (Buyer Beware!). A January 27, 2014, report on National Public Radio brought recent discussions into sharper focus. Though the story was unrelated to cancer, the lessons learned provide a road map for cancer patients in their pursuit of the most effective, least toxic treatments. The condition known as “clubfoot” (talipes equinovarus) is a congenital deformity that afflicts one of every 1,000 births in the US. The abnormal internal rotation of the ankle is highly debilitating if not corrected shortly after birth. For decades, orthopedic surgeons used complex surgical procedures that disrupted the ankle structure and realigned the bones. Despite numerous surgeries, this rarely corrected the deformity resulting in chronic arthritis and gait disturbances. The costs were significant and the loss of productivity for those afflicted even greater, yet the dilemma remained unresolved. Into the fray came Dr. Ignacio Ponseti. Ponseti, the son of a Spanish watchmaker, had gained a unique perspective on structural integrity working in his father’s shop. Fleeing the Spanish Civil War he came to the US to practice orthopedic surgery at the University of Iowa. Recognizing the poor outcomes for clubfoot surgery, he took it upon himself to rethink the problem. After all, newborns have flexible ligaments. These ligaments, he reasoned, could be re-trained through a series of casts that were replaced serially over months after birth. Once the foot was in better alignment, the children were placed in a boot to retrain the joint into its normal alignment. Not surprisingly, this simple, noninvasive, inexpensive method was eschewed by the orthopedic professionals. Undaunted, he continued to practice his art, with excellent results year after year. 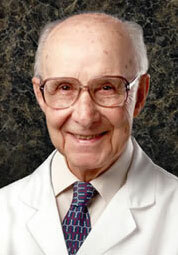 Dr. John Herzenberg, a Baltimore-based practitioner of the Ponseti method was quoted: “People were falling over themselves to do fancy invasive surgery, and this one strange old guy, who speaks softly with a Spanish accent in Iowa, was getting sort of ignored by the drumbeat of people who were in favor of surgery.” Despite its obvious appeal and its manifest successes, this technique remained largely in Iowa for 50 years. And then came the Internet. When a child born with clubfoot in 2000 was recommended for standard surgery, her mother went online to examine all the options and came across Dr. Ponseti. She traveled to Iowa for an opinion. Convinced that Dr. Ponseti’s approach was superior, this brave mother took the leap and undertook the Ponseti method. Dr. Ponseti completely corrected the child’s foot. Horrified that her daughter would have suffered a life of misery without this brilliant breakthrough, this young mother took it upon herself to get the word out. Using the Internet, she created a Yahoo Support Group called “No Surgery 4 Clubfoot.” Families with afflicted children could now find out about this technique and identify practitioners who used it. Voting with their feet, parents took their children to centers that applied this simple, relatively noninvasive approach. Over time, the academic community and their adherents to invasive surgery found themselves on the wrong side of patient referrals. Demanding better outcomes for their children, parents charted a new course for their medical care and forced their doctors to agree or be left behind. With a 97% success rate today, virtually every orthopedic surgeon in America practices the Ponseti method. Indeed, it is now recommended by the American Academy of Orthopedic Surgeons. I relate this story to cancer patients as they confront similar resistance. While marginally effective therapies are promoted by many academic centers, simple, comparatively easy techniques are available that can empower patients in treatment selection. Just like the clubfoot parents, cancer patients must demand access to treatment options and explore every lead. The Internet has offered an entirely new platform for cancer patients to communicate their experiences, recommend physicians, educate friends and family members and change referral patterns. The power to change the way cancer is treated in America today is within the grasp of the patients themselves. Just like Dr. Ponseti, who knew that his method worked and just like his patients who avoided the pain and suffering they would have otherwise endured, patients enlightened about better ways to treat cancer need to communicate and take charge of their disease. The recent blog “Stand Up To Cancer Research!” described some of the pitfalls of modern cancer research and the clinical trial process. It has engendered an active discussion. It may be helpful to address some of issues raised. For those of you who did not have the opportunity to read that blog, it defined the difficulty that many patients encounter when they seek experimental treatments. 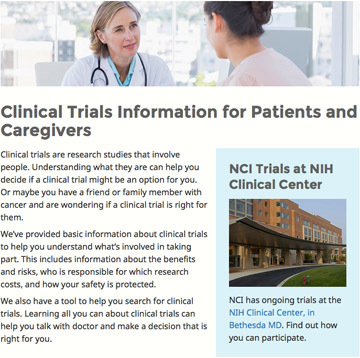 Clinical trials are often only available at select centers, sometimes at great distances from patient’s homes. There can be rigid inclusionary and exclusionary criteria, and the pre-entry evaluations e.g. re-biopsy, CT/PET, etc. can be daunting, time consuming and inconvenient. Travel and accommodations may come at great personal expense. I penned the blog, in part, to remind patients that they are ultimately in control of the process. One patient asked how can “we stand up to the system” describing herself a consumer while “they’ve got the goods.” This is the frustration many people feel. It should be remembered, however, that a substantial portion of research support comes from tax dollars and charitable donations. These are your dollars. If the system is not working, then those responsible must be held accountable. The American public has the power of the vote. Patient advocates can approach and lobby their representatives and demand improvements in the clinical trial process. To wit, the level of scrutiny and restriction upon access to new drugs must be re-examined. There is an army of well-trained clinical oncologists capable of delivering experimental drugs today. Not just the fully vetted, just-about-ready-for-prime-time agents currently found in phase III trials, but the really new exciting drugs. 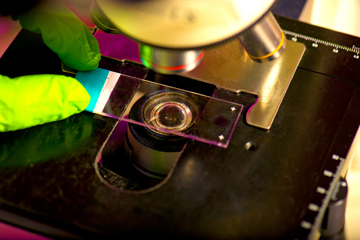 Once a drug has passed Phase I and found to be safe in patients, open up the accrual process. “Compassionate use” has virtually disappeared from the lexicon of cancer research. Twenty years ago I made a discovery in the laboratory. Working with the pharmaceutical company and the FDA, we were almost immediately granted access to a yet-to-be approved agent. The combination proved so effective that today it is one of the most widely used regimens in the world. That would not happen today. We simply cannot get access to the best drugs for our patients. With the industrialization of medical care, growth of mega-medical systems and the increasing role of government, medicine must be viewed through a different lens. Changes in cancer research will require changes in cancer policy, and policy comes from political power. Cancer patients will need to identify legitimate spokespeople to take their concerns forward to their elected officials. While the current clinical trial process slowly grinds out new development, even the smartest, fastest trials take years to change practice. Every day, more than 1,500 cancer patients die in the United States alone. 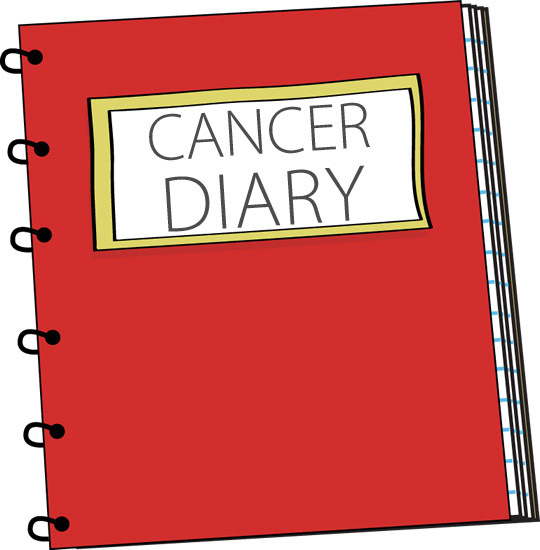 Cancer patients do not have time for clever doctors to pose interesting questions while they suffer the slings and arrows of ignoble, ineffective therapy. It is time for a change in cancer research, and patients must be the instrument for that change. Epidemiologic studies that correlate disease states with socioeconomic status, level of education, geographic location, lifestyle or diet are fraught with confounding variables. Nonetheless, well-done studies can open a wealth of interesting questions regarding non-treatment related aspects of our health and well-being. This study is provocative for it identifies the interaction between marital status and stage at diagnosis, as well as overall survival. There are many ways one might interpret the findings. The accompanying editorial (Marriage Is as Protective as Chemotherapy in Cancer Care, Kissane, D) notes that non-married status may reflect “reduced adherence to state-of-the-art treatment.” That, we presume, would include such variables as regular physicals, frequency of mammograms, PSA evaluations, willingness to undergo surgery or the use of adjuvant treatments. The role of depression is also noted. While all of these may apply, they have a self-serving ring, whereby good health, it would seem, can only be attributed to good doctoring. Controversies surrounding PSA screening or the impact of “annual physicals” on general health are but a few examples where more may not necessarily be better. While it may be argued that unmarried individuals fail to obtain adequate medical care, the data may reflect somethin g more profound, the psychoneuroimmunology of cancer survivorship. That is, each patient’s capacity to will-themselves better. The will-to-live is enhanced by close human relationships. We are all witness to patients who survive against all odds. They are usually filled with zeal, willing to go to whatever lengths are required to overcome their illness and most have close interpersonal relationships, nurturing environments, loving families or husbands and wives who dote on them. Norman Cousins spoke at length about the healing force of one’s emotional and spiritual belief systems in his own battle with ankylosing spondylitis (Anatomy of An Illness, As Perceived by the Patient, 1979). Might his experience reflect a similar dynamic to that described in the current study? My patient Alan Kapuler’s excellent outcome over Non-Hodgkin’s lymphoma, described in my book (Outliving Cancer, 2013, chapter 12) exemplifies this same mind-over-matter dedication, characteristic of many of our long-term survivors. I applaud Dr. Aizer and his co- investigators for examining this aspect of cancer survivorship. I am impressed that such a report would find its way onto the pages of the Journal of Clinical Oncology. However, I am less certain that these good outcomes reflect state-of-the-art treatment and more of the opinion that married patients may be part of a happier, healthier, better adjusted and more humanly connected population. Interpersonal relationships are not devices. They cannot be patented or sold. However, as can be seen from this study, they may be among the most powerful interventions at our disposal in the management of advanced cancer. Is There a Role for Maintenance Therapy in Cancer Treatment? There is a long tradition of maintenance therapy in pediatric oncology. Children with acute lymphoblastic leukemia uniformly receive three stages of therapy: induction, consolidation, and finally maintenance. The maintenance stage consists of weekly, or even daily therapies. The historical experiences of relapse in this population lead investigators to consistently expose these patients to drugs for a period of years. Despite the apparent success of this approach in childhood cancers, long-term maintenance therapy did not gain popularity in adult oncology. Why? There are probably several reasons. One reason is that childhood leukemia is among the most chemo-responsive diseases in medicine. As such, there are many active drugs available for treatment and many non-cross-resistant maintenance schedules that can be employed. A second reason is the relative tolerability of drugs like oral thioguanine or mercaptopurine that are used in chronic maintenance therapy. By contrast adult tumors rarely achieve complete remissions. The number of active drugs has historically been very limited and the tolerance of long-term treatments characteristically poor. Despite this, there is an appealing rational for maintenance therapy. Once we recognized and incorporated the tenents of apoptosis and programmed cell death into cancer management, we were forced to reconsider many of the principles of older treatment protocols. Conceptually, maintenance allows for a cytotoxic exposure when the cell enters a “chemosensitive” period in its life cycle. Cancer cells that are “out surviving” their normal counterparts often do so in a quiescent stage (G0 Gx). In order to capture these cells, drugs must be present in the body when these cells awaken from their dormancy. 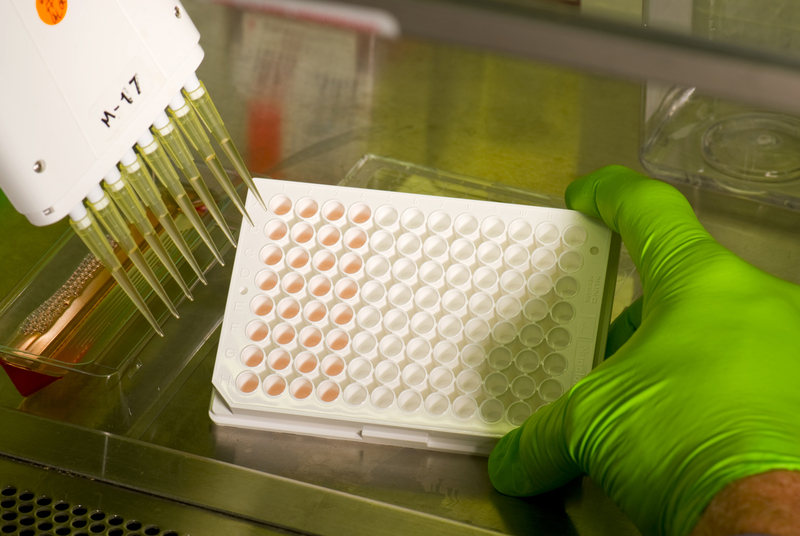 As we have now achieved increasingly durable remissions in diseases like breast cancer, small cell lung and ovarian, we are confronting patients in long-term complete remission. When you add to this newfound population the availability of comparably mild agents, like the low dose Gemcitabine/Cisplatin doublet, we now have at our disposal active drugs that can be safely continued for long periods of time. Using laboratory selection to identify first line (induction), second line (consolidation) and finally third line (maintenance) schedules, we can now offer our patients well-tolerated combinations that offer the hope of more durable remissions. 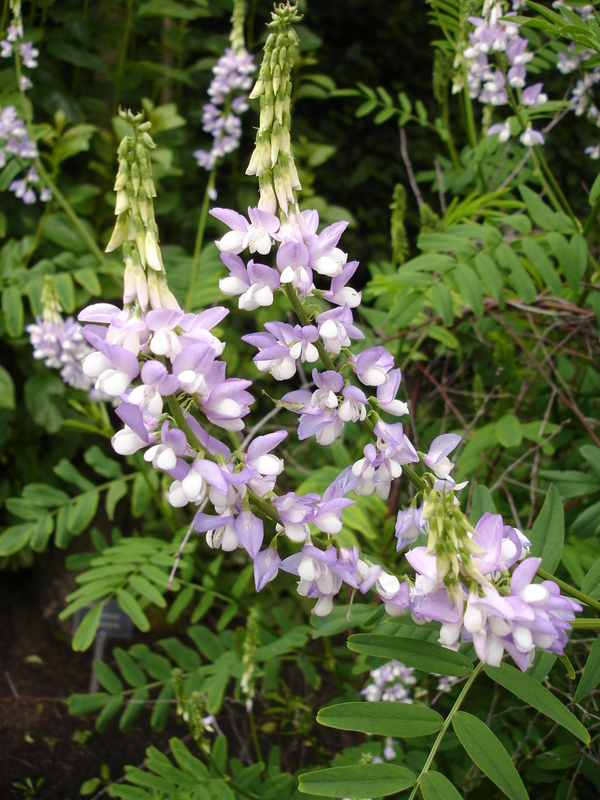 The GOG 178, in which continued taxol dosing provided more durable remission in ovarian cancer, provided the first inklings of this. Unfortunately, taxol is toxic. And the more durable remissions came at an increasingly high price: neuropathy, myelosuppression, alopecia, fatigue and malaise, which greatly limited the utility of this approach. Yet it does not limit its theoretical attractiveness as we continue to develop targeted agents with more selective activity and modified toxicity profiles. We anticipate maintenance therapies will become more widespread. Based upon our experiences to date, we are successfully using this approach with our patients who achieve good clinical remissions. 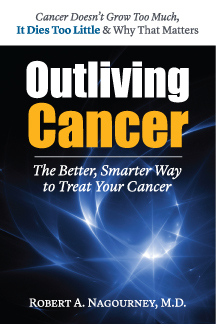 You can find more information about our use of maintenance therapy, in Chapter 14 of the book Outliving Cancer. This blog was originally posted in August 2011.